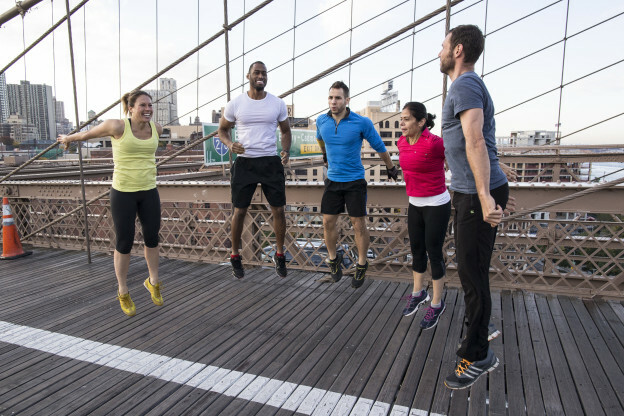 If you’ve tried one of our workouts that combine strength training and cardio like Brooklyn Bridge Boot Camp: Slim & Strong Drills or Flex Studio TRX Inspired Workout, you know how intense they can be. The good news is that putting yourself through a tough workout that mixes cardio and strength intervals has many benefits. As Brooklyn Bridge Bootcamp says, “Conventional cardio programs burn muscle, not fat, and thus don’t provide the lasting results you’re looking for”. Instead, strength training intervals will help to build the lean muscle mass that helps your body burn fat – even hours after your workout is complete! By completing strength training moves during your rest periods of cardio, you’ll be burning more calories than if you just took a complete rest. This makes it an efficient form of exercise for when you’re short on time! If you do steady state cardio for a longer period of time, you’re not able to push yourself as hard as you would in a short but intense interval. By incorporating cardio intervals into your strength training, you’ll improve your cardiovascular fitness while getting a total-body workout. Intense intervals followed by less intense intervals help to stimulate your body’s production of human growth hormone. This means that your body will continue to burn calories for up to 24-48 hours after your workout. This entry was posted in Fitness Tips and tagged cardio, cardio fitness, fitness tips, hiit, interval training, strength training on July 8, 2015 by TeamBooya.